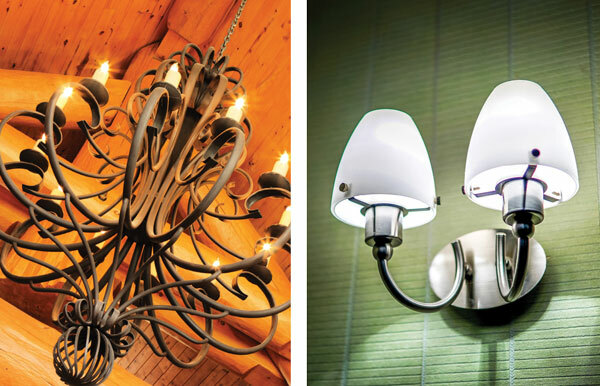 Lighting is an important aspect of design in any room. While it serves the basic function of allowing us to see better indoors, it also provides a chance to express personal style. “Light fixtures are the jewelry in a home,” says Miranda Dudley, interior designer and owner of Designer Solutions in Moneta. “They can make a big design statement.” Chandeliers, pendants, lamps and wall sconces lend sparkle and warmth, and updating them can instantly transform a space. In a new build, a well-considered lighting scheme is a critical piece of the planning process. Here are some tools, tips and tricks to help your home be bright and stylish. If you’ve decided to update lighting in your home but don’t know where to start, browse design magazines and online sources for ideas and inspiration. Walk through your home with a pencil and paper and think about whether lighting is preventing you from using an area the way you’d like. Jot down your ideas and wish list, and if you’re reluctant to tackle it on your own, many interior designers offer in-home consultations at an hourly rate (depending on the designer, this could be anywhere from $25/hr to $100/ hr). Also, some lighting stores will do an on-site consultation for a small fee, and make recommendations without obligation to buy, which can be helpful. A fresh eye may also bring up ideas you hadn’t considered that could make your space function better. While changing out existing fixtures is a DIY project for most homeowners, call electricians for quotes on more complicated work, like installing recessed can lights. Talk to any designer like Dudley about lighting, and they’ll tell you layering is key. Layering means having options for any circumstance in a room. For example, if you are working in the kitchen, bright task lighting ensures you can chop, cook and bake with ease. 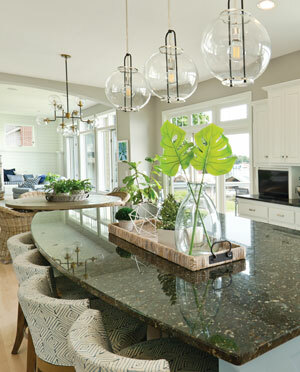 But if you are having a cocktail party around the kitchen island, you’ll want the ability to soften lighting for a pleasant glow. Consider each room in your house and what you do there, suggests Dudley. In the living room do you watch TV, read and entertain? Is the room particularly dark during any part of the day when you wish it wasn’t? For a multi-tasking room like this one, recessed lighting on dimmers is a great first layer, because they can be turned up for maximum lighting when you’re cleaning or want bright light. They can also be dimmed for a more relaxing vibe. Adding floor lamps at reading spots, like a chair or the coziest seat on the couch, makes reading easy. Table lamps on side tables or a hutch can bring in another interesting dimension. If you have a ho-hum chandelier or pendants and want to update them, you now have more choices than ever. “You can update the decorative lights in your home easily, because there are so many options now that you can go from highend to reasonably priced,” Dudley says. For example, if you see a high-end fixture that grabs you but don’t want to invest that much, take a picture of it to a designer, a local showroom, or search online for one with similar lines and materials. If you are updating fixtures for resale, buyers are gravitating to warm metals like burnished brass, gold and bronze. Farmhouse, industrial, and architectural shapes like globes are going strong. 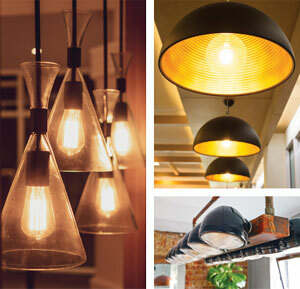 Organic-inspired fixtures with imperfect shapes are also popular, made with materials like ceramic and hand-blown glass. More fixtures than ever are offered in LED, which is especially trendy with eco-conscious homeowners. While LED lights once cast a bluish, cold glow, the technology has improved. The color temperature is now better, and the light can be indistinguishable from the glow of a traditional incandescent fixture. It’s a great option for hard-to-reach areas, like a chandelier in a two-story foyer, because LEDs last for years, so light bulb changes are practically eliminated. Keep in mind that you’ll pay more for an LED fixture, but will save in energy costs. If you like the new warmer metals but are afraid they won’t match other finishes in your home, such as cabinet pulls or other lighting, know that mixing and matching gets the designer “OK.” A way to make it look more intentional is to repeat the metal somewhere else in the space. So if you go for a burnished brass chandelier, find a mirror to hang on the wall that’s the same metal tone. Repetition of colors or elements is a designer trick to make a space look pulled together. Lights that are too big or small for a space always look awkward, and when a designer is hired to spruce up a room, that’s one of the things they look at first, says Dudley. If it’s sized inappropriately, it really should go. Many homeowners misjudge size when looking at a fixture in the store, so take a tape measure along and know the approximate size you need. A general formula for chandelier or pendant selection in a dining room is that a fixture should have a diameter of one-half to two-thirds the width of the table. To size a light as the focal point of any other space, like a living room or foyer, measure the length and width of the room (to the nearest foot) and add those figures together. The sum of those two numbers is the approximate recommended diameter of your chandelier or pendant (in inches). Standard ceiling height is eight feet, and historic homes can have even lower ceilings, so keep this in mind when shopping. If you have tall or cathedral ceilings, you’ll need to go bigger so that the space doesn’t dwarf your fixture. Make sure you know the store’s return policy, as your best option is to try it out at home (with a helper holding it in place) to make sure it works. Once you’ve chosen the correct size, it needs to be hung at the correct height. Over a table, a fixture can hang as low as 30 inches above the table (measuring from the top of the table to the bottom of the fixture). It may need to be higher if the fixture is visually heavy (you can’t see through it) or if tall family members or guests will be staring directly into the light. In areas where a fixture isn’t hanging over furniture, be sure that a tall person can walk under it, and in a home’s entry, front door clearance is vital. For homes with low ceilings, semiflush mounted fixtures can add interest while allowing for needed clearance. Building a home gives you the chance to design a custom lighting scheme, says Dudley, who recommends that you take the time to walk through the house with the electrician before the lighting goes in, to place each fixture and outlet. Her tips? “In an open floor plan, outlets in the floor allow you to place lamps without having to see electrical cords going to the wall,” Dudley suggests. Also, she favors LED rope or strip lighting for under cabinet lights, and has put them in the interiors of cabinets with glass doors to light up the contents. “LED is so compact and it doesn’t get hot, so it can be placed almost anywhere… which gives us a lot of options,” she says. These details may seem overwhelming to consider when the walls of the house aren’t even up, but change orders to the electrical plan after the drywall or plaster is completed can be costly. Again, it’s best to think about what you’ll be doing in each room. If you want the office to be a workroom and a place to charge phones, be sure you’ve got recessed cans or a bright fixture, and a place to plug in devices and your desk lamp. If you are doing built-ins, would a library light be a nice addition to highlight your bookshelves? If you have art that you love, think about where you’ll hang it in the new house. Library/museum lights above art can be stunning and unexpected. Or, if you have a mirror or art that would look good flanked by sconces, consider those for a design punch. The most common places for sconces are on either side of a generous mirror, in the dining room flanking a piece of furniture or art, to light the way on a staircase or in a hallway, and in an entry. In the dining room, if your table is rectangular and long, think about hanging two pendants or chandeliers to break up the length of the table, instead of one in the center. Miniature pendants and chandeliers are popping up in bathrooms, laundry rooms and walk-in closets, so consider whether those might add to your enjoyment of these utilitarian spaces. In the bedroom, a switch on either side of the bed that you can easily reach is great for turning the light on or off without getting up. A stylish choice in the bedroom that has been growing in popularity is to have two small hanging chandeliers at either side of the bed in place of other bedside lighting. Think about where you want switch controls to be in each room based on how you’ll be entering and exiting the space. For example, do you want a master switch at the top of the stairs to turn off your basement can lights, so you don’t have to descend the stairs to turn everything off? 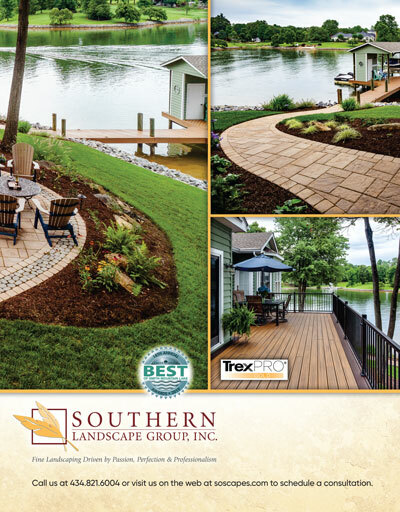 Before finalizing your plan, it’s a good idea to consult a designer or a second eye to be sure you haven’t missed anything crucial.